If you are looking for an exciting travel destination this June, this infographic, brought to you by Search Academy, is what you’ve been looking for! 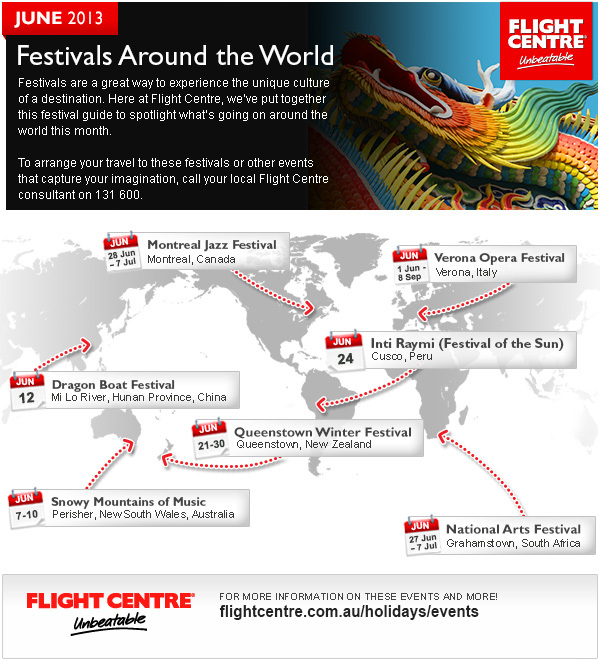 It highlights seven June festivals from around the world, so whether you’re headed to Canada, Italy, Peru, China, New Zealand, Australia or South Africa, there’s something to celebrate. Fill your vacation with some smooth jazz, classic opera or extraordinary artwork. The possibilities for vacation fun are endless. Let the festivals begin! Stubhub reveals 10 incredible world records held by different events.